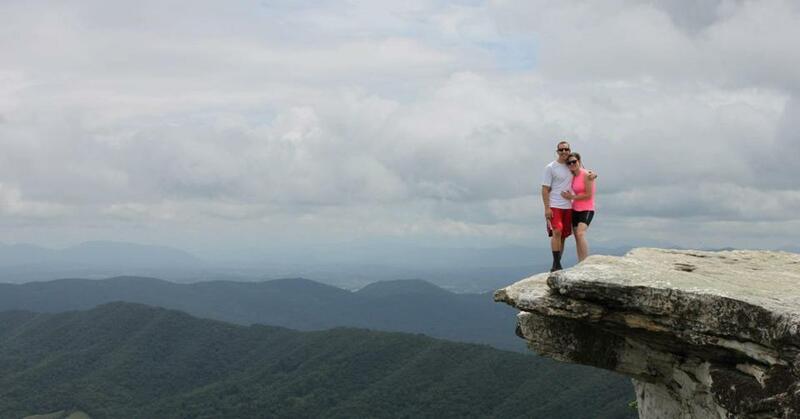 A washout brings unexpected benefits in Roanoke, Va.
Sean Nicolio and Amber Parson at McAfee Knob on the Appalachian Trail. ROANOKE, Va. — We had it all planned. Because the Roanoke Valley is famed for its outdoors offerings, my partner, Lina, and I devised a travelers’ triathlon of sorts. First we would hike on the Appalachian Trail; then, without a swimming hole, we’d rent paddle boats at Carvin Cove Nature Reserve, a short drive from downtown Roanoke; finally, we’d bike on some of the city’s 20 miles of greenways, many running along the Roanoke River. The day before we arrived, it rained. And rained. And rained some more, to the point, we later learned, that the river had crested more than 14 feet. A bright spot in the gloomy weather when we hit town was the Roanoke Star. At 1,045 feet above the city and lighted with 2,000 feet of neon tubing, the 88.5-foot-high steel structure is the city’s trademark, so memorable that I recalled waving to it from the back seat of my parents’ car as a child. Since the star’s switch was first flipped in 1949, it’s seen various color themes, but these days stays white except for special occasions. The next morning, segment one of our “tri” went off without a hitch: a hike to McAfee Knob. Originally overwhelmed with a list of more than 50 area hikes to choose from, I’d polled a few locals for their favorites. McAfee won because it was a short drive from town, challenging, doable in half a day (if you hustle), and known as the most photographed site along the 2,178-mile trail from Georgia to Maine. Could it really be that visually spectacular? 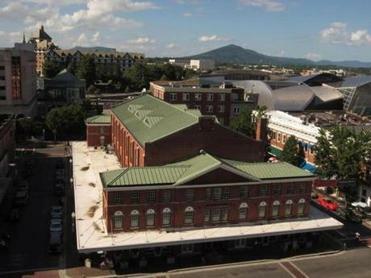 From the rooftop overlook at Center in the Square, the view includes the 1922 City Market Building and the Blue Ridge mountains in the distance. If you go to Roanoke. . . If you go to Roanoke, Va. Ask Sean Nicolio and Amber Parson, both 27, of Ashburn. As we reached the rocky top, at 3,197 feet, the two were embracing and Parson was crying after just accepting Nicolio’s marriage proposal. “This is the best place ever,” Parson agreed as she took in the view, a 270-degree panorama of the Catawba and Roanoke valleys and surrounding mountains. We snapped a few photos for the couple as they posed precariously on the famed spot nonacrophobics flock to — a ledge surrounded by sky. With our 8-mile hike checked off, we drove to segment two of our plan, the 12,700-acre Carvin Cove reservoir, where visitors can hike, mountain bike, and pedal or paddle the huge body of water in kayaks and paddle boats. We were disappointed to find it closed; the rain had flooded the docks and parking lot. Seeking higher land, we headed to the base of the star at Mill Mountain Park, our tired legs begging us to drive up the mountain instead of tackle the 3.5-mile round-trip hike. At the top you can also visit the Mill Mountain Zoo and Discovery Center and take in terrific views of the valley, surrounding peaks, and downtown, including its vintage neon signs advertising Dr Pepper and H&C Coffee. We lucked out that evening, arriving downtown in time for First Friday Art by Night, a vibrant art hop showcasing a dozen galleries and shops. Many are housed in restored early-1900s buildings raised when Roanoke was a railroad powerhouse. Stand-outs included the artists cooperative Market Gallery; the high-end contemporary Signature 9 Gallery; and Wilson Hughes Gallery, a high-ceilinged room filled with abstract paintings and bicycle-part sculptures. The art is created by owners John Wilson and Suzun Hughes, who relocated from San Francisco in 2007 in search of affordable space. Hughes led us outside to Wilson’s “curated wall,” a brick canvas of colorful murals and graffiti covering the side of their building. While there, she pointed out several surrounding Art Deco buildings just renovated or in the process, many for living space. To the outsider, Roanoke proper feels larger than its population of 97,000, especially because of its sizable downtown and active neighborhoods. Friendly locals I chatted with said the city had come alive in just the past few years, and one former resident I ran into twice, who now lives in Houston, couldn’t stop raving about the changes. The next day, our challenge was to venture into a few neighborhoods by navigating the scenic Roanoke River Greenway, a popular paved bike trail snaking through town and crossing the river at several points. We made it only a few hundred yards before we hit barricades. Because of the flood, several sections of the trail were under water. Undaunted, we wound our way through Old Southwest, an architecturally rich residential area, and over to the charming Grandin Village, a revitalized business district born in the 1920s and now home to Roanoke Natural Foods Co-op, a Saturday farmers’ market, the restored 1932 Grandin Theater, boutiques, yoga studio, and the farm-to-table hot spot, Local Roots restaurant. Heading back downtown, we popped into Black Dog Salvage, an architecture salvage operation whose affable owners star in the DIY Network show “Salvage Dawgs” and whose 40,000-square-foot showroom is crammed with vintage columns, doors, windows, and bathtubs. Without Roanoke’s network of bicycle paths at our disposal, we headed back to town and found plenty to do. Downtown is anchored by the Historic Roanoke City Market, since 1882 a continuously operating market with 50 outdoor stalls. Across the street sits the 1922 City Market Building, now home to a fairly pedestrian food court except for the remarkable veggie-focused Firefly Fare, which has an adjoining sweet little restaurant and patio street side and a super personable owner-chef, Chris Parkhurst. Adjacent to the city market is Center in the Square, a recently renovated seven-story complex that houses three museums, a butterfly habitat, green-roof pavilion, and overlook. A block away is the impressive Taubman Museum of Art, housed since 2008 in a shiny Frank Gehry-esque building — that clashes with everything around it. Give Roanoke credit for its architectural risk-taking and commitment to the arts. The Star City’s rail heritage is fascinatingly documented along the tucked-away David R. & Susan S. Goode Railwalk, a quarter-mile path between the Taubman and the Virginia Museum of Transportation. Paralleling a set of active rail lines, displays along the trail explain the powerful influence the railroad industry had over the development of Roanoke. They include memorabilia and even signal lights, bells, and ear-splitting foghorns that visitors can gleefully operate. When we reached the down-home and kid-friendly transportation museum, we learned that Roanoke is looking to the rails once again to attract visitors. Amtrak has plans to bring passenger service to town, and a fund-raising push is underway to restore the museum’s “Queen of Steam,” a 1950 Norfolk & Western J-Class 611, revered by rail buffs. As for our little outdoors challenge, we’re taking a rain check on the greenway. And the washout had an unexpected benefit: the opportunity to dig deeper into Roanoke’s past and present. As we headed out of town around dusk, we waved goodbye to the illuminated star, one of the many bright lights in this big-hearted little city.